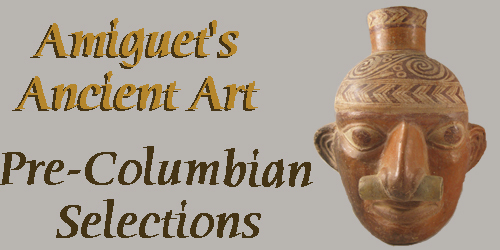 Thank you for visiting our extensive selection of Precolumbian Art and Artifacts! The objects offered for sale here are all guaranteed to be accurately represented with regard to authenticity and condition. The menu at the left catagorizes our inventory into the various areas of origin or culture from the New World. Many of these ancient objects were traded and traveled extensively throughout the regions and many cultures settled in widespread locales. Please take the time to look through the pages, you might be surprised at what you'll find!